What is the Best Supplement to take for Joint Pain? Turmeric, a root related to ginger, contains anti-inflammatory properties, which give it a reputation of being among the best joint health supplements. When purchasing turmeric as a remedy to reduce joint pain, it’s more beneficial to purchase the spice in a bottle, since it is usually combined with piperine, a pepper, a compound which aids the spice into the bloodstream rather than remaining in the stomach. For centuries, turmeric extracts have been respected as an effective remedy for treating osteoarthritis symptoms, joint pain relief, intestinal cancer, stomach cancer and even Alzheimer’s disease. For thousands of years, Turmeric has been used as a food and as a health supplement. Because it has a low toxicity as well as antiplatelet, anti-inflammatory, and antioxidant activites, Turmeric is an excellent addition to the diet for long-term prevention and treatment of inflammation and cardiovascular diseases, and is one of the most powerful inhibitors of formation of prostaglandins and thromboxanes (active lipid compounds) that promote excessive inflammation. Turmeric also reduces pain by decreasing local fluid levels and is regarded as one of the best arthritis joint pain treatments. India’s traditional Ayurvedic physicians, who have confirmed Turmeric’s anti-inflammatory, enti-edemic and anti-arthritic properties, and have traditionally used Turmeric for rheumatoid arthritis, and a wide variety of other inflammatory diseases as well as for wounds, upset stomach, liver problems and eczema. Some physicians prefer applying two parts turmeric and one part salt to swollen areas, sometimes also include ginger with this mixture. The most active components of Turmeric are the volatile oils and Curcumin, which is a potent antioxidant and combats free radicals better than vitamin E. Curcumin is also effective in depleting the nerve endings of substance P, the neurotransmitter of pain receptors, and therefore makes it one of the most affective . At the Gandhi Medical College in Bhopal, India, researchers treated those who suffered with arthritic pain with oral doses of turmeric and cortisone acetate injections. Arthritic swelling on day 13 was significantly less in those who were treated with turmeric and cortisone, compared to the controls. The protective effect of Turmeric is attributed to its anti-histamine properties. Turmeric exhibits anti-inflammatory action, which is partly based on its natural ability to inhibit arachidonic acid metabolism. This effects the inflammatory exzymes 5-lipoxygenase and cyclooxygenase, which gives it less side effects than asprin, but unlike asprin, Turmeric has been shown to specifically not interfere with beneficial prostaglandins, such as those that protect the stomach. Why place additional stress to the body when you can treat the body naturally by consuming Turmeric? Due to its natural properties, Turmeric has a long history of safe use as food and has caused no adverse effects in clinical trials. Of all arthritis remedies, this herb is regarded as one of the safest to consume, as no toxicity has been observed in toxicology studies nor have any clinical studies reported any adverse effects. Tumeric and other quality joint health nutrients are featured in Natural Assets' Formula for Joints. Click here for more information. Also, see our arthritis cream pain relief product Jaguar Arthritis Cream. Curcumin is an active extracted component that derives from Turmeric. Curcumin is natural anti-inflammatory remedy that is regarded to be as effective as cortisone and phenylbutazone when used as an arthritis cure. With its ability to keep the neurotransmitter substance P from sending pain signals to the brain, Curcumin has been one of the best remedies among arthritis treatments. In a study involving two groups of patients with rheumatoid arthritis, Group A was given 1,200 of Curcumin, while Group B was given 300 mg/day of phenylbutazone. Although both groups experienced morning stiffness and joint swelling reduction, Group B experienced significant adverse effects including abdominal pain and upset stomach, which are among the most common side effects of phenylbutazone. Group A, who consumed curcumin, not only experienced arthritis pain relief, but also did not suffer from any side effects. In Bombay, India, a study evaluated 40 patients who had suffered from spermatic cord swelling and tenderness due to hernia operations. Group A was prescribed 400mg of Curcumin, while Group B was given 100mg of phenylbutazone. A significant decrease in pain was experienced by both groups, but only Group A experienced a reduction in inflammation, due to Curcumin's anti-inflammatory qualities. 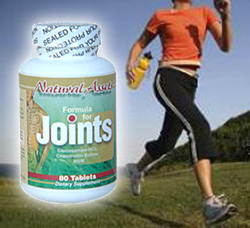 Curcumin is featured in Natural Assets' Formula for Joints. Click here for more information. • Chandra, Dinesh, and S.S. Goupta, “Anti-inflammatory and Antiarthritic Activity of Volatile Oil of Curcuma Longa (Haldi),” Indian Journal of Medical Research 60(1): 138-42, Jan. 1972. • Degalau, J., et al., “The Use of Oral Dehydroepiandrosterone Sulfate as an Adjuvant in Tetanus and Influenza Vaccination of the Elderly,” Vaccine 14(16): 1531-37, 1996. • Ershler, Willaim B., Intriguing Insights into Longevity (Chicago: Encyclopaedia Britannica, 1993), 395. • Nadkarni AK, Nadkarni KM. Indian Materia Medica vol 2. Bombay: Popular Prakashan. 1976:414-18.